In a move to promote reconciliation and Indigenous awareness Alberta Native News newspaper has partnered with Wakina Gallery to make available original Indigenous art at wholesale prices that can be purchased as affordable and meaningful Appreciation Gifts. The art is largely from the collection of original illustrations and carvings that have appeared in Alberta Native News over the past 30 years. The gifts are beautiful, original and hand crafted by emerging and established Indigenous artists. The prices are very affordable because Wakina Gallery is an online gallery so there are no hidden overhead costs. Alberta Native News has been the premiere newspaper for Indigenous people across the province for 32 years – providing in-depth news and feature articles to urban and rural First Nations and Metis communities across the Prairies and throughout the North. The newspaper is particularly well known for its beautiful monthly cover images by acclaimed artists such as Alex Janvier, Jane Ash Poitras, Daphne Ojdig, Aaron Paquette, Maxine Noel and countless others spanning the life of the newspaper. 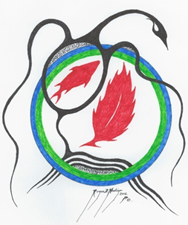 In addition to the cover images, each edition also includes stunning pen and ink illustrations by emerging Indigenous artists from Treaty 6 and Treaty 8 Territories. It is these original illustrations – some in colour and others in gray scale and black and white – that are available, in addition to breath-taking soap stone carvings hand crafted by Dene carver Anthony Antoine. To view a selection of the carvings and illustrations that are available for sale, please visit wakinagallery.com and be advised that we have many more pieces that have not yet been posted. Purchases can be made through the website and viewings and purchases can also be arranged by appointment at the gallery, Suite A, 10632 124 Street, Edmonton, AB by contacting curator Dan Moser at (780) 237-1556 or wakinagallery@gmail.com.